Fast becoming regular callers at Clydebank once more, the Danish-registered tanker TERNVIK was making her way downriver past Gourock when seen on Saturday morning. 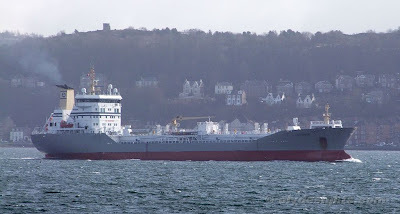 Bound for Mongstad, where she had loaded her cargo for the Nustar fuel depot at Rothesay Dock, this ship had changed her name fairly recently - from TARNVIK - in November 2009. She was built in China in 2001 and has a deadweight of 14,796 tonnes. She is 141.2 metres overall.